Paijit Sangchai loves to solve problems that seem unsolvable. "There are so many environmental problems associated with papermaking, I thought I should do something about it," he says. 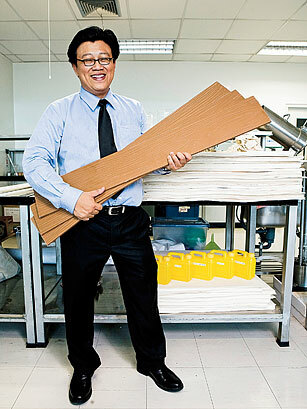 In his native Thailand, laminated paper wasn't being recycled, so it was often burned. Since founding Flexoresearch in 2007, he's developed five series of enzymes for various aspects of recycling paper. While several are local adaptations of existing technologies, the blends of enzymes that peel away plastic, aluminum and other substances from paper are unique. For every 300 tons of coated paper, Paijit produces 270 tons of recycled pulp, plastic and metals. His pulp can be used as a replacement for asbestos in construction materials. It's stronger, safer and cheaper. The benefits are manifold. Making more types of paper ripe for recycling can help protect forests, reduce waste that would end up burned or in landfills, boost the incomes of the scavengers who collect paper, improve air quality and lessen health risks. The goal is to turn waste into wealth and pollution into profit, Paijit says. With his factory operating at capacity, that's anything but pulp fiction.